Brits Bingo have a new promotion on this weekend called the Woodstock Weekender. Visit the Young and Wild room today and tomorrow and you could win a guaranteed jackpot of £50 when you bingo on the Rainbow pattern. 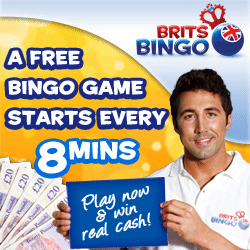 These special pattern games play every half an hour and cost just 10p per ticket to play. Everyone's a winner this weekend with a fantastic deposit special where Brits Bingo will multiply your deposits by 10 and convert them into loyalty points. So if you deposit £10 you will get 100 points, deposit £100 and get 1000 points! The top 3 depositors this weekend will also win extra points with a 1st place prize of 50 times your deposit in points, second prize of 30 times your deposit and third prize of 20 times your deposit. There's literally loads of points up for grabs so whip your debit card out and start claiming yours! Play the Secret Garden slot game this weekend and you could win £25 in bingo bonus if you're amongst the top 10 players who win the most money and you could also pick up £5 if you know the answer to this week's quiz question, which is: When and where did the first Woodstock Festival take place? Know the answer? Pop it across to [email protected] and you might be one of the 20 lucky winners who will be selected at random to win a £5 prize. New members who join this bingo site will get a free £1 no deposit bonus to try out the site as well as 200% first deposit bonus up to £200 and 50% on future deposits between £20 and £100.